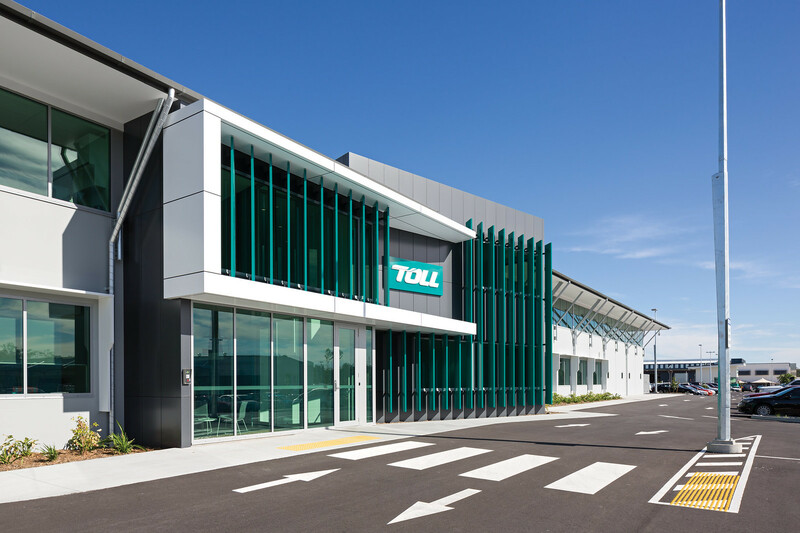 As Australia’s largest mover of freight, Toll Group thinks and works on a large scale – and their new freight facility in Brisbane’s southeast demonstrates that. 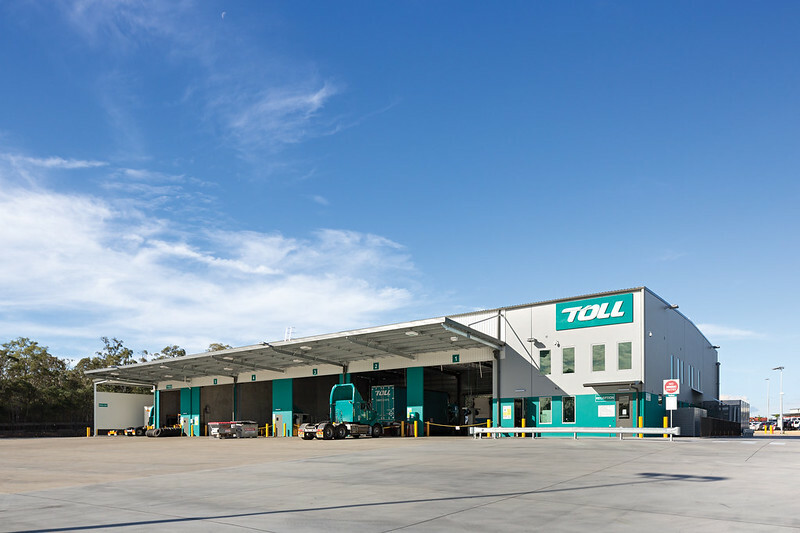 Located on a 13 hectare site and constructed by FDC Construction & Fitout (Qld) for The GPT Group, the facility, leased by Toll, is the largest pallet and oversize freight depot Toll Group operates anywhere in the world. The heart of the complex is a massive drivethrough warehouse covering 36,000 square metres. A two-level operations building controls the comings and goings of trucks and their loads. About two-thirds of its 2090 square metres is inserted into the warehouse. An administration building covering 3500 square metres is connected to the warehouse by an aerial bridge. It functions as the national head office of Toll NQX (part of Toll Group) and has open workstation areas, a call centre, outdoor recreation areas and even sleeping quarters for drivers. Across the site and flanked by hectares of hardstand and car parking, is a substantial 1946 square metre workshop for Toll’s specialised fleet services business which services trucks and forklifts, and has two levels of offices as well as tyre and welding bays and a truck washbay. Completing the complex is a gatehouse. 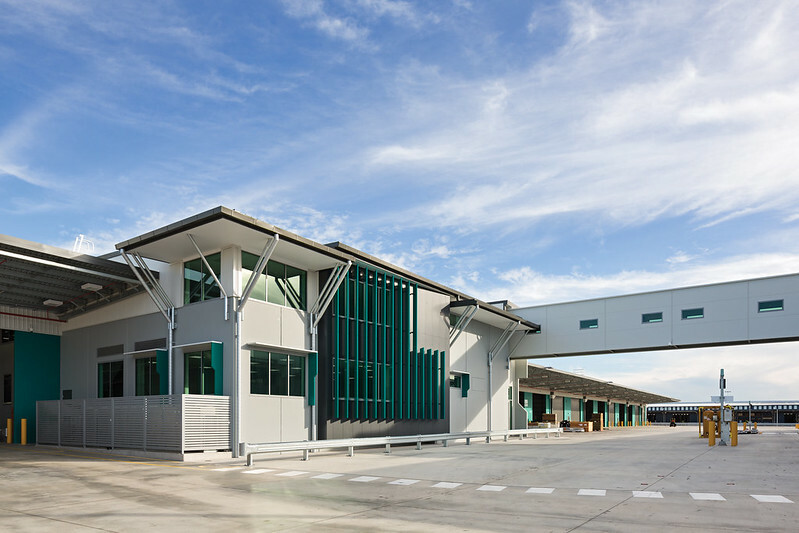 These four buildings – operations, administration, workshop and gatehouse – are steel framed and clad with precast concrete, 137 panels in all totalling 2200 square metres of walling, manufactured and installed by Austral Precast, Australia’s largest precaster.The blade signage at the front entrance is also a precast concrete panel. 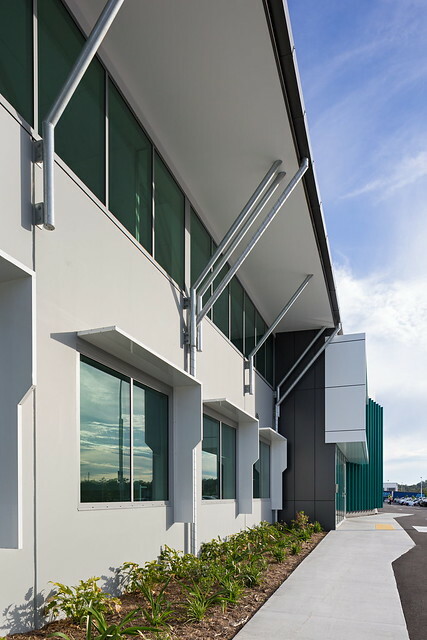 Because the structure of industrial buildings – that is, the concrete and steel – is a large proportion of the building cost, there is a greater need “to get the design tight and efficient to build, fabricate and deliver,” explains Aaron Hughes, the lead structural engineer for this project. 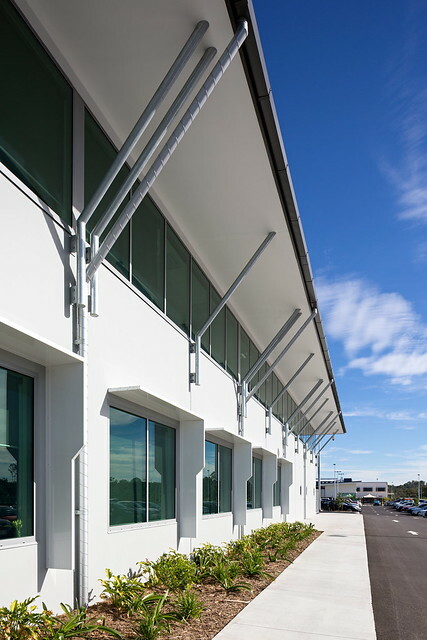 He emphasises that less is not always more, especially when it comes to structural steel.“If the designer doesn’t have a good idea of how the precasters work or how the structural steel contractor works, then they are not going to be able to produce the most efficient design, even if their analysis is superior to that of another engineer. The structural engineering team worked closely with the architectural team, whose job is to look at the functionality of the spaces and the overall site design, and related issues such as accessibility and meeting relevant codes.“It very much comes back to functionality and spaces and the way the client needs to use a facility like this,” says Mitchell McGuire who was the co-leader of the architectural team with Emma Somers. Both Mitchell and Aaron emphasise that speed of construction is essential on these projects and that the precast component is a critical component of the work program.This requires tight coordination between the engineering and architectural teams, as well as the steel and precast manufacturers and the construction team. Drawings must be translated into concrete and steel with millimetre accuracy.“The steelwork contractor needs to coordinate with the precaster; because ultimately a bolt has to line up with a bolt hole,”Aaron Hughes says simply. 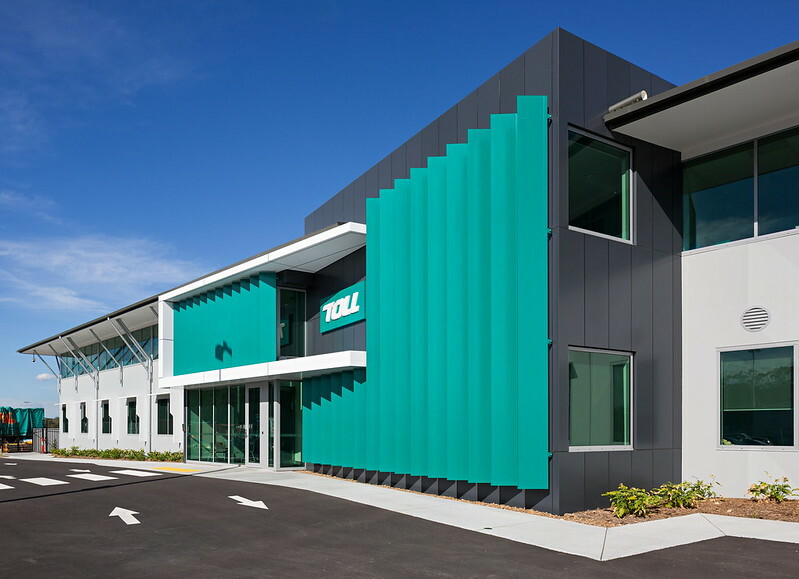 Speed, scale, coordination, accuracy, quality and innovation.These are the characteristics of industryleading companies such as Toll.They are also the qualities that have made Austral Precast not just the market leader in their field but “the default choice” of the precasting industry.